This game was a home banker but didn’t play out that well, with West Ham making lots of silly mistakes early on. Most of these errors were happening in the centre back positions with both Reid and Tomkins making poor decisions and bad passes. Leicester didn’t capitalise on this luckily enough, but we were just piling the pressure on ourselves. However we caught a break half way though the half, when Andy Carroll showed the other side of his game intercepting a bad ball from ex-hammer and local boy Paul Konchesky to rush onto goal from a decent way out and then dink over the Leicester goalie to open the scoring. I say the other side as I’m getting a bit fed up with Andy not getting any credit for his groundwork (including from some West Ham fans) . He links up and works as hard as anyone, and is getting to see the benefit of his efforts recently. Surely he cannot be too far from getting his England place back from Ricky Lambert. As for Konchesky, I’m not sure at that point in the game he really appreciated the “he’s one of our own” chant from the Lower Bobby Moore stand. The second half was all West Ham, and they capitalised when Sakho directed a great header to the rejuvenated Downing, who controlled the ball fantastically and scored a goal, bending it into the far corner, worthy of any Goal of the Month montage. From then on , Leicester seem to pick up but didn’t really get a chance until the final minutes when Ulloa directed a great header which forced a greater save from the mainly unused Adrian to keep a clean sheet for West Ham. Adrian seems to have his detractors all over the place, but there are probably only 3 real world class keepers on the planet currently, and he is realistically as good as we can get. I like him anyway, and he seems to have sorted out his reluctance to leave his line for crosses, and dealt with nearly every Leicester corner yesterday. Kevin Nolan was basically taking up a space yesterday. You can see he’s trying but once Noble is fit I think a spell on the bench, covering injuries and suspension is Kevin’s future. Or maybe we could move him on for a few quid in January to one of the top Championship teams, where he would flourish. Bottom line was that West Ham in the main were subpar, but got a decent win against a team under pressure. Talking of which I don’t know if Nigel Pearson is still in a job, but this is a man that got Leicester promoted with 102 points, and now is in line for the chop (despite getting minimal funding for players during the promotion summer). The Leicester fans were singing his name throughout the game , but as we all know, the people who pay to go every game, have no say in these situations. As well as the scorers, Alex Song was immense again yesterday, prompting a quote from behind me “Song seems to be playing a different game to everyone else on the pitch” and I have to agree. Could be the signing of the season if we can secure him permanently in January. That said, the priority for me has to be a leader in the back four, especially if Reid is on his way (although both of his suitors are below us in the league). Although I have been joking with all and sundry about our Champions League debut next year, it really is still not a target for me, so I haven’t really gone there in this blog. BUT, our next 2 games are Chelsea and Arsenal. 4 points there, and who knows? Lose both and we are in 7th at worst, so it’s all to play for. Remember. A Champions League place is not just for Christmas. MOTM yesterday, for his work, ground covered, and goal was Andy Carroll. 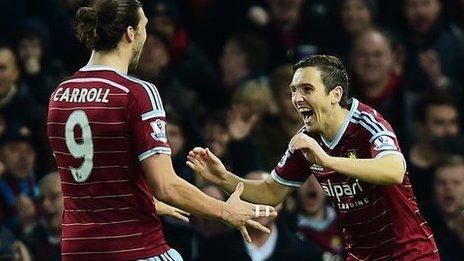 MOTM Carroll with our other scorer Stewart Downing.